Bald River Falls - This is the tallest of 12 waterfalls in the area and it is right on River Road. To get to River Road just drive east on the Skyway, about 4.5 miles from Tellico Plains, to the Bald River Falls//Tellico Plains Ranger Station sign. Turn right on River Road. Drive 5.7 miles to the falls. To the left of the parking area you can walk up the trail to the top of the falls. After the falls you may continue east on River Road to the beautiful North River. Turn at the North River sign and drive 11 miles up a paved, then good gravel, road to the Skyway. 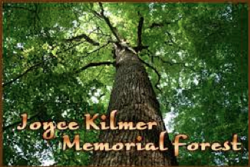 Joyce Kilmer Memorial Forest - Turn right on the Skyway heading toward North Carolina. Large vistas to stop and look at acres of National Forest along the road. National Forests unlike National Parks are allowed to be used for camping, hiking, horse backing riding in designated areas. Continue on the Skyway to the Joyce Kilmer Forest which is about two miles from the North Carolina end of the Skyway (sign on the left). There is a lovely Figure 8 Trail you can take through the first stand trees - never cut and very large. Even when it's hot, it's cool there! 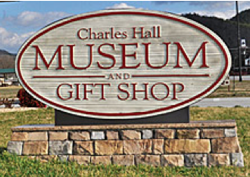 Charles Hall Museum - Charles Hall, who was mayor for 31 years, has made more contributions to this community than one might be able to remember. Without him and his wife, Billie Nell, we would not have a community center, a library, or a modern water and sewer system. He owned the telephone company for many years, and brought it into the twentieth century. You will find a large collection photographs, artifacts, guns and collectibles detailing the history of Tellico Plains from his private collection. Admission is free in either of his two museum buildings - a fascinating place to visit and you may bump into Charles who is there most days. The Cherohala Skyway was completed in the fall of 1996 after planning and construction for some thirty-four years. Winding up and over 5,400 foot mountains for 18 miles in North Carolina and descending another 23 miles into the deeply forested backcountry of Tennessee. The road crosses through the Cherokee and Nantahala National Forests thus the name "Chero...hala". The Skyway is becoming well known in motorcycling and sports car circles for its long, sweeping corners, scenic views and cool summer breezes. Deals Gap aka "The Dragon" (el. 1,988 ft -606 m) is a mountain pass along the North Carolina - Tennessee state line, bordering the Great Smokey Mountain National Park and near the Little Tennessee River. At .7 miles (1.1 km) south of the gap is the unincorporated community that shares the same name, located at the intersection of US129 and NC28. The area is internationally famous destination for motorcycle and sports car enthusiasts, who cross the gap into Tennessee to drive along the "The Dragon." It is located along a stretch of two-lane road known since 1981 as "The Dragon." The 11-mile stretch of The Dragon in Tennessee is said to have 318 curves. Some of the Dragon's sharpest curves have names like Copperhead Corner, Hog Pen Bend, Wheelie Hell, Shade Tree Corner, Mud Corner, Sunset Corner, Gravity Cavity, Beginner's End, and Brake or Bust Bend. The road earned its name from its curves being said to resemble a dragon's tail. The Lost Sea Adventure begins with a guided tour of the caverns. 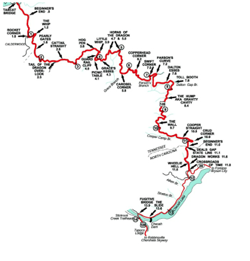 This involves a 3/4 mile round-trip walk on wide sloping pathways. 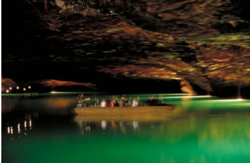 While touring the caverns and underground lake our guides will tell of the cavern's exciting and colorful history. They will also explain the fascinating geological development of the immense cavern rooms and rare formations. At the bottom of the cave you will board a glass-bottom boat for an exciting trip on the Lost Sea, America's Largest underground lake. Fort Loudoun was a British colonial-era fort located in what is now Monroe County, Tennessee, United States. Built in 1756 and 1757 to help garner Cherokee support for the British at the outset of the Seven Years' War, the fort was one of first significant British outposts west of the Appalachian Mountains. Relations between the garrison of Fort Loudoun and the local Cherokee inhabitants were initially cordial, but soured in 1758 due to hostilities between Cherokee fighters and European settlers in Virginia and South Carolina. After the massacre of several Cherokee chiefs who were being held hostage at Fort Prince George, the Cherokee laid siege to Fort Loudoun in March 1760. The fort was reconstructed in the 20th century and designated a National Historic Landmark in 1965, and is now the focus of Fort Loudoun State Park. Sequoyah Birthplace Museum - Sequoyah (1776 - 1843) They called him Sequoyah. And, this great Cherokee Indian gave his people an enduring gift. He gave them a writing system - so that the greatness of the Cherokee Nation will live forever. Never before, or since, in the history of the world has one man, not literate in any language, perfected a system for reading and writing a language. In recognition of his contributions, the Cherokee Nation awarded Sequoyah a silver medal created in his honor and a lifetime literary pension. He continued to serve Cherokee people as a statesman and diplomat until his death. Coker Creek Gold Panning - Heritage and culture experiences are the primary emphasis in this recreation zone. It is home to the nationally recognized Millennium Trail, The Unicoi Turnpike and gold panning opportunities. Looking for a cultural heritage excursion? Pan for gold in the community of Coker Creek. 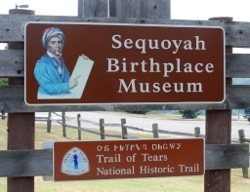 Hike a portion of the Unicoi Turnpike, an ancient travel route once part of the Trail of Tears and now a nationally designated Flagship Millennium Trail. 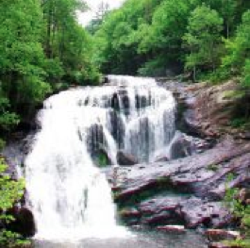 Visit the waterfalls in Coker Creek Scenic Area and drive along Hiwassee Scenic River on TN 68. Sweetwater Valley Farm - Our farm, located between the towns of Philadelphia and Loudon, is in the heart of southeast Tennessee's dairy-rich Sweetwater Valley. While today's Sweetwater Valley Farm cheese is produced in a state-of-the-art facility, the fine art and craft of making cheese in the traditional farmstead manner has been preserved. Please plan to stop by our farm store to see where our fine cheeses are made and to sample one of our award-winning cheddars. Cheese.Cows.Wows! 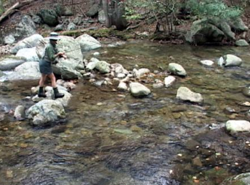 The Tellico River with Fishing is in the Cherokee National Forest in southeast Tennessee. 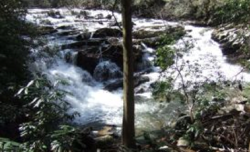 Its headwaters begin in North Carolina and flows for almost twenty miles to Tellico Plains, Tennessee. The main stem of the Tellico River is heavily stocked by the state and requires a special permit to fish. It's a very large freestone mountain stream.